On February 15, 2011, Chris Shelton went missing. On April 8, 2011, his body was found in a ditch in Okmulgee County, Oklahoma. The Medical Examiner reported that Shelton died from a gunshot wound. 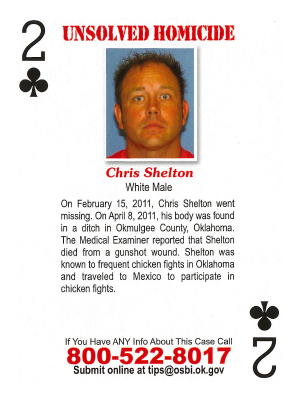 Shelton was known to frequent chicken fights in Oklahoma and traveled to Mexico to participate in chicken fights.